This game is often played by “bench warmers” who do not sing, pray, work or do anything much in the church but sit. They like to put the “backfield in motion” by making a trip back and forth to the restroom or water fountain. During “halftime,” when the music has ended and the sermon has not yet begun, they like to play “staying in the pocket,” keeping their money to themselves as the offering plate is passed. Church footballers allow their children to run a “draw play” with the bulletin during the service. When the “two-minute warning” sounds and the sermon is almost over, they will try a “quarterback sneak,” leaving quietly during the invitation. The preacher often tries to catch bench warmers in a “trap play” by calling on them to pray while they’re doing a quarterback sneak out the door. Church footballers often try to avoid the trap play with the “end run,” getting out of church quick, without speaking to the preacher or any other members. Then there is a “blitz” to the local restaurants. Many will also exercise the “halfback option,” as 50% of the congregation will not return to the evening service, especially on Super Bowl Sunday. But then there is another breed of church football players. They are real winners who refuse to punt when the devil has them down on fourth and long. They choose to get into the game, block for their pastor, and tackle thorny problems. The preacher likes to put these people on the first string. When “sudden death” comes, they are the ones best prepared for the “overtime,” because they have committed the Head Coach’s playbook to memory and trusted Him to be right. They really believe they will win, no matter how big the opponent is, and because of their faith, they experience the thrill of victory, not the agony of defeat. Which kind of church football player are you? Millions of people gather around their television sets to watch sports championship games. Some will be very happy after the game, and others will be very disappointed. But in the end, it really doesn’t matter. In the end, it will not matter what team you follow, but it will matter whether or not you followed Jesus. In the end, it will not matter what nation you lived in, but it will matter whether you were you in the kingdom of God. In the end, it will not matter what terrorists you feared, but whether you feared God. In the end, it will not matter which church you attended, but whether you were part of the body of Christ. In the end, it will not matter what your political affiliation was, but whether your affiliation was with Jesus. In the end, it will not matter where you worked, but whether you served Jesus. In the end, it will not matter what family or culture you were born in, but whether you were born again into the family of God. Because in the end, what will matter is not whether you got your name in the history books, but did you get your name in the Lamb’s Book of Life? At age 16, Gabrielle Douglas became one of the most inspiring athletes at the 2012 Olympics in London, winning the gold medal in gymnastics and becoming the first African-American to win the gold medal in gymnastics. She wowed the crowd with her skill, and then gave all the glory to God. But as young as she is, it still took years to get there. She began training at age 6, at the encouragement of her older sister. Athletes like Gabby Douglas inspire all of us, because we appreciate the dedication they put into training their bodies to excel. But the Bible teaches us that this same principle applies in even greater ways to our spiritual lives. We should training our spirits, getting into spiritual shape, but how? Dotsie Bausch was a runway model, but she developed a severe eating disorder. She felt like her life was out of control, and went to a counselor who suggested that she do something new in her life. So she started riding a mountain bicycle. One day she was riding around Griffith Park in Los Angeles when a group of guys flew past on road bikes. Dotsie chased them. Her heart was pounding, her legs burning, but she stayed on their heels for one mile, then two miles. These guys were competitive cyclists, but she was keeping up with them on a clunky mountain bike, no less. That night she told a friend, “This cycling thing, I’m actually pretty decent at it.” Four years later she was on the U.S. national cycling team, and became the seven-time U.S. National champion. Just as Dotsie had a life-changing experience that caused her to put her whole heart into physical training, so we need to have a life-changing experience with Jesus Christ that causes us to have a new desire to get into spiritual shape. Exodus 40 tells how they consecrated the tabernacle by anointing everything and everybody in it, and then it says after they did that, the glory of the Lord filled the place. Don’t you want the glory of the Lord to fill your heart? When you have a heart-felt desire to follow God, when you desire it more than anything, and you are willing to make a public statement of it, being baptized, saying publicly you are a believer and proud of it, that’s when things start happening. That’s when the glory comes down. In football, the offense has a big obstacle. It’s called the defense. The defense tries to stop your drive. It tries to block your way. It tries to get you stuck on the field. It tries to keep you from scoring. In football, it’s called the defense. In your spiritual life, the defense is the demon-fence. The old devil wants to stop you. And guess what? Part of that problem is in your own life. The Bible calls it the “flesh.” You have a flesh nature at war with your spirit nature. If you ignore the flesh nature, it will trip you up. God has given you a spiritual football, but you have to remove the hindrances. You need an offensive line to block for you. You need to learn how to run around the defenders. You need to learn how to get up and go again when they knock you down. Listen to me! This will require making some hard choices. It may be painful. But you must do it. Do it now. Choose to remove the hindrances to your spiritual life, especially sinful lifestyles that have been dragging you down. Do it! There are two major types of exercise: cardiovascular exercise, also known as aerobic exercise, and strength training, which is usually by lifting weights. Some people just do cardio and they are all skin and bones with little muscle, and some just lift weights and have bulging muscles but a fat stomach and they can’t up the stairs without breathing hard, but the most healthy people do both. In a similar way, you need a balanced daily exercise that includes both habits, or actions, and your thinking. Daily habits. Just as a person must exercise daily to get into physical shape, you must exercise spiritual disciplines daily to get into spiritual shape. 1 Corinthians 9:26-27: “Therefore I do not run like one who runs aimlessly or box like one beating the air. Instead, I discipline my body and bring it under strict control, so that after preaching to others, I myself will not be disqualified.” And what is that discipline to bring ourselves under control? We need to practice the daily habits like Bible reading, stewardship and resisting temptation. Some people say, “But I don’t like to read, so I don’t read the Bible.” If you don’t like to read, do you like to hear? Get the Bible on CD and listen to it driving to work. If your heart’s desire is to hear from God, this does not have to be a problem. Many people say they don’t like to read, yet they read text messages all the time! God has a message for you in this text! Read small portions of the Bible, like one chapter a day. Get an easy-to-read translation. I preach from the Holman Christian Standard Bible, which is easy to read and is accurate. If you need something very easy to read, I would recommend the New Living Translation. Stewardship involves giving of yourself to God. That includes your time, your talent, and your treasure. God deserves it all. Give him a regular portion of your time in worship at church. Give him a regular portion of your talent by volunteering to serve. Give him a regular portion of your treasure by tithing from your income to support your church financially. This reminds us of the importance of resisting temptation. You must make it a daily habit to say “no” to temptation. It is going to come. That is guaranteed. So make a practice of living according to the Spirit, not according to the flesh. You have a choice of what you are going to think about. If you constantly turn over problems in your mind, you are going to worry and get depressed. If you constantly meditate on God’s word and talk to Him in prayer, you are going to grow stronger and be lifted up. We need to practice the spiritual disciplines of prayer, meditation, and worship. Prayer and meditation can go hand in hand with Bible reading. Many Christians find that the best time for this is early in the morning, when their minds are fresh. Read over the scripture, then ask yourself some questions: what is God saying to me? Is there a promise to claim? A sin to confess and forsake? A resolution to make? A truth to learn? Then on Sunday we need the spiritual discipline of worship with other believers. We benefit from the fellowship and Bible study as well. And in the worship service, as we come together, we get the spiritual lift that we need for that week. A Christian, Humber finally said he had to relinquish control and focus on God instead of worrying about what others thought of him. Then in April of this year, he pitched perfect game against the Seattle Mariners, winning 4-0. Philippians 3:13-14: “Brothers, I do not consider myself to have taken hold of it. But one thing I do: forgetting what is behind and reaching forward to what is ahead, I pursue as my goal the prize promised by God’s heavenly call in Christ Jesus.” Usain Bolt is the fastest man in the world. In 2009, he ran 100 meters in 9.58 seconds. When he runs he focuses on just one thing: the finish line. As you grow spiritually, your focus is Jesus. Keep your eyes on Jesus, and God’s call go reach your goal in heaven. 1 Peter 2:21: “Christ also suffered for you, leaving you an example, so you should follow in His steps.” Jesus is your role model. He’s your example. Learn everything you can about Jesus. If you’re new to reading the Bible, read the gospels. Notice how he treated people. Notice how he talked. Follow His example, and you will grow spiritually strong. Four years ago, I weighed 225 pounds, and I decided it was time to get into shape physically. The same principles we have talked about today spiritually, I saw happen physically in my life. When I got in shape physically, it all started with a decision. I was huffing and puffing to walk up the stairs. My pants were too tight. I had enough of that. I got serious about getting into shape. I put my heart into it. When I decided to get into shape, I had to change some things in my life. I had to change some of my eating habits. I starting eating baked and grilled instead of fried foods more often, and eating more fruit and vegetables. I started going to bed earlier and getting up earlier to exercise. I began to go to the YMCA five days a week. When I started exercising regularly, I started rotating between cardiovascular exercise and weight-lifting. And when I started getting into shape, I focused on reaching goals. When I started, I weighed 225 pounds. Now I weigh 195 pounds. I could barely lift 80 pounds on the bench press. Now I can bench press 175 pounds. Riding a bicycle 2 miles was a huge chore. This summer, I rode a bicycle 44 miles. Now, I’m excited about that, but I’m more excited about my spiritual life! The greatest day in my life was the day I gave my heart and soul to Jesus. And while I am far from perfect, I have seen how God has helped me grow as I decided to remove hindrances in my spiritual life and develop those habits of obedience. It has been a continual growing process. I remember as a seventh-grader getting serious about reading the Bible, and I began the habit of reading the Bible from cover to cover. Then in the tenth grade, I sensed God calling me to preach the gospel while on a youth choir trip. In college, I discovered more about my spiritual gifts as I learned to service and exercise my faith in church ministry. As a young pastor, I was asked to preach a sermon series on prayer, and I had to confront the fact that my own prayer life was shallow, but through that I grew in my prayer life. Then later in my experience as a pastor, I became even more bold in sharing the gospel and personal witnessing. Am I where I need to be? No, I’m not. God has much work yet to do in me. But I thank God that I’m not where I used to be. How about you? Are you getting into spiritual shape? It’s got to start with a change of heart. Are you ready to begin the journey? I’m a 2nd year student at Georgia Tech and majoring in Business Administration. 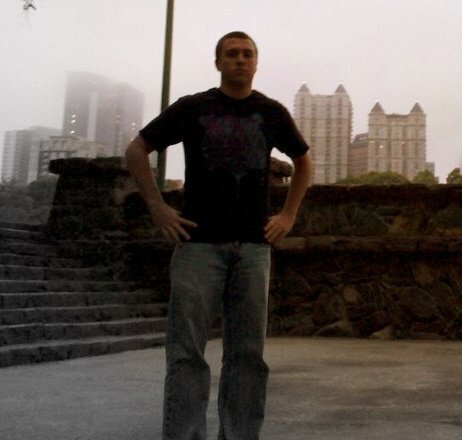 I am also a Baseball Announcer for WREK- 91.1 FM, the student radio station at Georgia Tech, and a huge sports fan. After I arrive back home, I spend the rest of the afternoon and night studying. I have an unusually busy week ahead with four tests and a weekend of baseball to prepare for. I wake up at 7:30 planning on heading to campus to help work on some technical aspects for our radio broadcast, but I get a text saying that it is covered. That means I get to spend the next few hours for some more studying. I have two tests today and I sandwich a nap in between them. After my last test, I get dinner at my apartment, watch TV, and just relax for a little while. At 7:00, I make one last trip for the day to campus, this time to the radio station, for our last formal Baseball Broadcasters’ Meeting to go over the equipment setup. After the meeting, I get some more studying in for my next test. I’m up early today at 6:30 to eat breakfast and get ready for class. I have one class at 8:00 and then a test after that. For the second straight day, I get a nice nap during the afternoon. I have one more class at 3:00, but when I get home after that class, I’m all studied out. Three of my four tests for the week are out of the way, so I am relaxing tonight. I get to sleep-in until about 11:00 today, but then I have a pair of classes separated by a two and a half hour break. After my last class ends at 5:00, I get some dinner at Chick-fil-A in the Student Center and head up to the radio station. I’m filling in as producer for the Ramblin’ Wreck Report and tonight we have our annual Baseball Preview Show. Our guests are Georgia Tech 1B/LHP Jake Davies and our closer RHP Luke Bard. (They happen to be the only current Jackets with brothers currently playing in the major leagues. Kyle Davies P for the Royals and Daniel Bard P for the Red Sox). After the show, I go home for a little bit, but I go back to campus for a bible study at 9:00. I catch a ride back to my place afterwards and study for a little while before going to bed. I have a pair of classes starting at 8:00 A.M. again. In between class, I head home to study for my last test of the week, but I get a text from a friend letting me know that the Atlanta Braves are handing out applications for summer jobs in the Student Center. I head back to the school earlier than usual to try and see if I can talk to someone from the Braves and see what kind of positions they were offering, but apparently they have already left, so I move my study station over to the library. I take my last test of the week in my last class of the week and head home to pack. Around 6:30, Nolan and I gather our equipment and hit the road for Rock Hill, South Carolina, where Georgia Tech is scheduled to play four games in the Coca-Cola Classic at Winthrop University against both Winthrop and Kent State. On the way, we make an extended stop at Nolan’s house for a delicious home-cooked meal. We get to the hotel around 12:30, where we are greeted by a pair of avid, older Tech Baseball fans, who are hanging around the lobby. They talk to us for a while before we finally get away and get to sleep after 1:00. We arrive at Winthrop Ballpark around 11:00, three hours before first pitch, to set up our equipment and prepare for an opening day doubleheader. In the first game, we have some frustrating technical issues, but eventually we get the issue resolved. It is a tough first game for the Jackets as well vs. Kent State. The Golden Flashes All-American P David Starn pitches eight shutout innings only allowing four singles, as Tech loses 5-0. Second game goes better for us in the booth and on the field. Matthew Grimes pitches seven innings and only allows one hit and Zane Evans pitches two perfect innings to lead Tech to a 5-0 win over Winthrop. At the hotel in the morning, we hear that there have been a few changes to the schedule because of weather expected tonight and tomorrow. Our game scheduled for today is moved up from 1:00 to noon and our game scheduled for tomorrow is moved to 7:00 tonight. The noon game goes by very quickly and the broadcast is even better than the day before. Tech gets revenge against Kent State winning 6-2, as Daniel Palka homers and scores four runs. In between games Nolan and I get some lunch away from the ballpark and head back to the hotel for a break. Will Long, another Tech baseball announcer, made the trip up for the day to Rock Hill, where he worked last summer broadcasting for the Carolina Stingers of the Southern Collegiate Baseball League. As we arrive back at the ballpark we hear that our second game has been moved up an additional hour to try and beat the rain. We get set up just in time for the first pitch. Will and Nolan do play-by-play and I rotate in to do some color broadcasting for the final game of the weekend. Tech beats Winthrop again, this time 5-3, to start the season 3-1. The team headed back last night, but Nolan and I stayed at the hotel. The weather forecasts were correct as it is a rainy day in Rock Hill that would not have been conducive for baseball. We check out of the hotel and make the drive back to Atlanta after a very successful first weekend of college baseball. I arrive back at my place around 4:00 and relax as I get set for another less busy week of school with more baseball. As you can see, my schedule as a college student can be very busy at times, but I am challenging myself with school and getting some great opportunities to be involved with things that I love.